You know that Facebook is a hive of spam and villainy, but visiting Claude the alligator’s page might make you love it again. 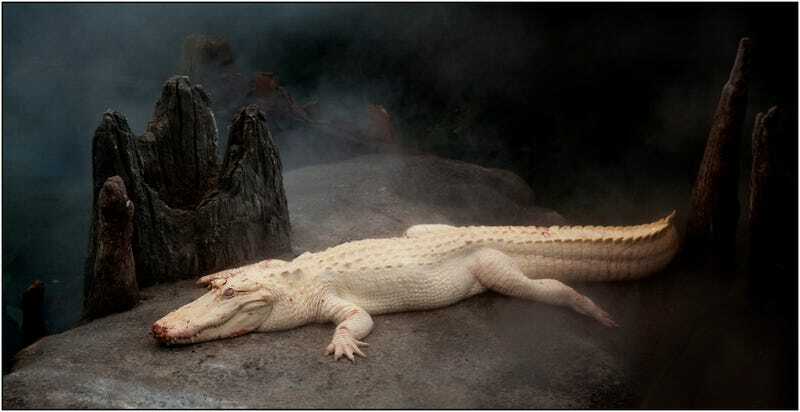 Claude is an albino alligator who lives at the California Academy of Sciences in San Francisco’s Golden Gate Park. On his page, he notes that he is “the main attraction” at the museum, which is exactly what you’d expect a 9.5 foot alligator to say. He is also a fan of LOLalligator pics, which also makes sense. Basically, Claude’s timeline is what Facebook is made for. But there are a few other things you should know about Claude. He’s an albino, so that means he can’t deal with direct sunlight — it would eventually kill him. But alligators love lazing in the sun all day. So Cal Academy has set up a giant, heated rock in the middle of his watery pen, where Claude spends his time getting warm and looking intensely lazy. At one point, he was given a female companion named Bonnie, who eventually bit one of his fingers off. So she had to go hang out in a different alligator home. You see, Claude is a peaceful dude. And he’s a little awkward. He’s partly blind, so he flails around a lot — a practice that annoyed Bonnie, and may have been why she bit him. And just a couple of months ago, poor, peaceful Claude got bitten again. This time, his nemesis was a snapping turtle who shared the pond with him. Now Claude is down one more finger, but he’s back from recovery and looking mighty fine. So far, no updates from his post-recovery life on the Facebook page, but I’m sure they’re coming soon. In the meantime, enjoy your new Facebook friendship with Claude — and if you’re in the San Francisco area, visit him at Cal Academy and say hi! UPDATE: The Cal Academy has gotten in touch to say that they are not in any way affiliated with this page about Claude (perhaps Claude created it on the sly?). They have “relevant updates” about Claude once in a while on their official Facebook page.